The “story theater” approach Gale Childs Daly employs is effective in bringing Charles Dickens’s “Great Expectations” to life on the stage at Philadelphia’s Arden Theatre. Director Matthew Decker is adept at creating dramatic and emotional levels for Daly’s adaptation, and he is much abetted by a sterling cast that focuses on Josh Carpenter as Pip and includes Brian McCann, Kate Czajakowski, Doug Hara, Lindsay Smiling, and the remarkable Sally Mercer in a variety of roles. Mercer has the unenviable task of playing Miss Havisham, the wealthy woman who is so stricken by her wedding-day jilting, she has all the clocks in her ghostly, cobweb-ridden mansion set at the time of her disappointment, wears the yellowed bridal dress she donned for her special, and keeps her wedding cake on the table waiting for the slicing. I say “unenviable” because portrayals of Miss Havisham, like those of Lady Bracknell or Mrs. Malaprop, often put the emphasis on eccentricity or comic devices that cloud the full nature of the character. Mercer, if anything, makes Havisham frighteningly real by playing the coldness in the woman and the bitterness she wants to impose on others, in particular Pip and her ward, Estella. Mercer’s Havisham is intelligent, calculating, and keenly aware of the care she takes to preserve her moment of deep humiliation. She leaves the comic and strangeness in Miss Havisham to be understood by the audience while accentuating the dangerous manipulation of a woman in exceeding control of her actions, one bent on affecting other people’s lives. In doing so, Mercer and Decker provide a much richer experience and give extra layers of context and tension to the generally excellent and always engaging Arden production. Mercer also scores as Pip’s temperamental and perpetually exasperated sister, Mrs. Joe, who raises the child “by hand,” meaning with various smacks, slaps, spankings, and beatings. Daly’s selection of scenes, and Decker’s deft execution of them, belies the difficultly usually encountered in moving Dickens from the page to the stage. In spite of notable successes such as the Royal Shakespeare Company’s “Nicholas Nickleby” in the 1980s, a spate of “Christmas Carols,” and the musical, “Oliver!,” a perennial staple from the ’60s, Dickens’s work rarely translates smoothly to the theater. That’s because the prolific author’s prose lives so vividly on the page. It’s a challenge to depict all the salient details and to keep all the coincidences, such as the identity of the man who abandoned Miss Havisham at the altar, from appearing too neat when Dickens is brought to the theater. Daly’s is about the eighth adaptation I’ ve seen of “Great Expectations,” and it is only the second that’s had any merit. The depth, and the senses of time and occasion, Decker and his cast provide propel Daly’s rendition to the best of the bunch. Lindsay Smiling’s humble and affectionate Joe and Brian McCann’s rascal-on-best-behavior Magwitch join Mercer’s Havisham in being moving, anchoring performances. Josh Carpenter is appropriately loveable and ever-sympathetic as Pip. When we meet Pip as a seven-year-old encountering both the desperate and murderous Magwitch and imperious, inscrutable Miss Havisham, Carpenter is duly shy and boylike, giving his voice a bashful treble and looking ill at ease while showing signs of curiousness and eagerness to please. Being mistreated is of little moment to Pip. Like most children in Dickens, he is accustomed to being called a burden, being ordered about, and being raised “by hand,” with a poke here and a clout there. Because Pip’s life is not much different from that of other boys he might know, Carpenter does not play Pip as being sad or suffering from abuse. He shows his young character’s caution and uncertainty, but he endows him with a measure of cheer and a talent to go with a situation that makes all that happens to Pip more palatable and conducive to the general course of his life from childhood to young adulthood. Carpenter’s posture and diction improve as Pip ages. His eye becomes clearer and more keen. Carpenter’s Pip understands all of the circumstances in which he finds himself, or at least knows how to take advantage of benefits and good fortune when it strikes. He may be confused about a point or two, and wonder about the mysterious source of ready cash and all it affords, but he goes about life comfortably and competently, exuding both gratitude and satisfaction. Carpenter show the depth Pip has acquired by visibly regretting, in a shallow moment, his apprehension about the country blacksmith, Joe, coming to London and going out for ‘larks.’ You see the snobby, gentleman Pip fighting against the affectionate, generous Pip, who had only Joe for solace in his early days. Carpenter is especially good in the scenes in which Joe realizes he does not fit well in Pip’s circles, or in London in general, and voluntarily withdraws to go home to his forge and live happily where he is more attuned to the landscape. Lindsay Smiling is also touching during this scene, showing the wisdom, as well as the humility, of Joe. The beauty of Decker’s production is it remains atmospheric and dramatic throughout. It entices you to care about Pip and his journey towards becoming a mature adult. The coincidences I mentioned previously are rife, but they play as being natural and come off as startling revelations rather than as authorial contrivance that works better in literature than it does in the theater. Daly calls all characters but Pip a “narrator,” and in Decker’s production, the breaking of the fourth wall to advance the story by telling bits of it and establishing a sense of location, seems integral. It neither disturbs action or uses explanation in place of acting out a germane scene. Basic storytelling devices give the Arden’s “Great Expectations” shades and make what is depicted more gripping and immediate. “Great Expectations” was, in a way, my introduction to Dickens. I’d read both “David Copperfield” and “A Christmas Carol” before it, but “Great Expectations” was the first of Dickens’s novels that was assigned and talked about by a teacher, William J. Larkin, who had our entire eighth grade English class read the book aloud and who demonstrated the characters and spoke of how Dickens’s stories reflected Victorian England. I think this marked the first time I put a book in an historical context instead of regarding it as just a story. Mr. Larkin did something I regret to say few teachers managed to do. He changed my perspective. He made me, at age 12, care about authors and contexts and to go beyond the imaginative tales I, a voracious reader then as now, craved to know and play out, always as theater, is my head. In six of the eight times I’ve seen “Great Expectations” adapted, the renditions were stilted and pedantic. The lure of the book was not replaced, eclipsed, or even approximated by the stodgy events on stage. Gale Childs Daily finds the right formula to animate Dickens’s novel. She carefully chooses the scenes that will mesh story and theme, and she makes her dialogue clear, to the point, and respectful of the verbal tics Dickens gives his several characters. Matthew Decker finds the pacing and tone to make it all work. His fine corps of actors are not his only assistants in this. Thom Weaver’s charcoal- favoring lighting helps provide mood and atmosphere. Timothy R. Mackabee loads props on a mantel to make it easy to transition from a cozy blacksmith’s hut to a sumptuous ballroom at Miss Havisham’s. Olivera Gajic contributes astutely chosen costumes, although I thought Miss Havisham’s wedding dress a little bright for its years of wear and looked for signs of yellowing or graying. “Great Expectations” tells the story of Pip, who as child elides his full name, Philip Pirrip, into the moniker that he’ll use throughout this life. Orphaned before he can even remember his parents, Pip lived with his sister, a strict and unaffectionate woman, and her husband, Joe, a kindly blacksmith near the southeast coast of England. Pip is a fairly ordinary child who, living where are when he does, is unaware that his life is hard and unnurturing. He goes about of his daily rounds of amusement, exploring the woods and other haunts near his village. The cuffs he gets from his sister, and the companionship he gets from Joe are just part of the boy’s day. He is relatively content even though he is frequently insulted and abused. Mrs. Joe sees great expectations in Pip’s future when their uncle, Pumblechook, recommends Pip as a boy who can satisfy Miss Havisham’s random desire to see a child play. Miss Havisham finds Pip dull at first but is willing to taunt him into doing as she wants, part of which is to introduce him to her ward, Estella. Pip has also had an adventure by which he helped an escaped convict to food and a file to gnaw through his chains. Miss Havisham and the encounter with the prisoner give Pip’s life a bit more color than that of other Victorian boys, but his days are generally spent in drudgery. At a time when he is about to apprentice as Joe’s forge, a surprise event brings Pip to London and seems to signify more great expectations. Pip also learns about love through his infatuation with Estella, who does return his affection and keeps warning Pip she was raised to be heartless and unresponsive to trifles like romance or the sensitivity of one’s feelings. Decker and his cast capture all of the humanity in Pip’s story and makes it delightful and enlightening to follow. As matters develop, we are treated to an array of the kinds of figures Dickens put so indelibly on the literary landscape. Decker’s production is smart and involving for its duration. Josh Carpenter wins your heart at Pip. The boy may be used to the slap on the cheek or the switch Mrs. Joe made a from a tree branch to discipline him, but Carpenter makes us recoil from any mistreatment Pip receives. He is that quick to earn our loyalty and concern. Carpenter is adroit at showing all aspects of Pip’s development from his wariness and discomfort at Miss Havisham’s to his falling in love with Estella, who he first regards as a teasing friend, one you like to tease you, and later thinks of as a great beauty who is in tune with the larger world. The actors keeps you fond of the adult Pip who strived to learn the ways of the world himself and proves a loyal friend and admirable young man. 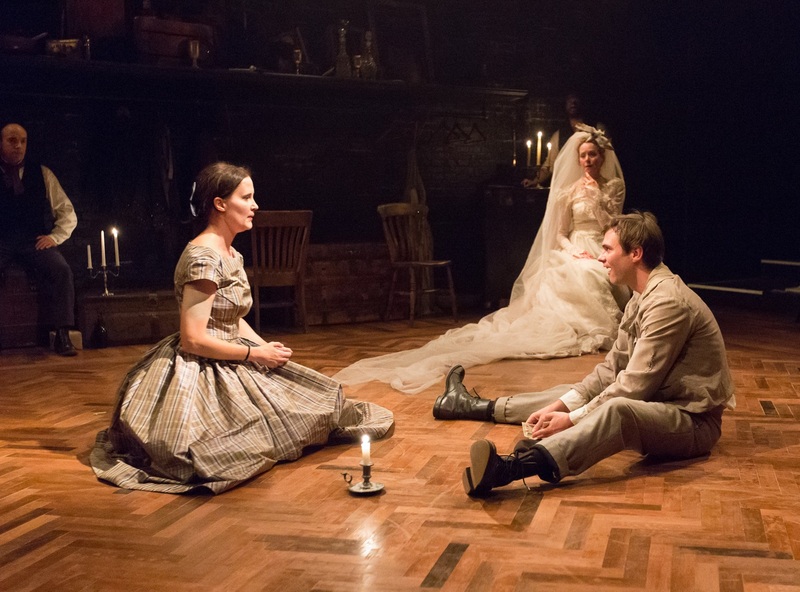 Sally Mercer’s cannily austere playing of Miss Havisham is among the gems in Decker’s staging. Mercer shows Havisham delighting in instigating disappointment and reveling in the misery she spreads to others. She is also effective in portraying Havisham when she realizes her reign of suppressed emotion and cruelty has gone too far and that she may have driven away all who may have given her moments of happiness to compensate for the grief she’s been harboring since her aborted wedding day. As Mrs. Joe, Mercer shows a different kind of sternness. Her face coarsens, and she turns from being haughtily calculating to mean. Mrs. Joe is just continuing the style of child rearing many of the working class in Victorian England could expect. Her belief that she is doing the right and just thing toughens her, and Mercer’s Mrs. Joe seems to find nothing that can leaven her day or give her happiness. She might light up a little when Uncle Pumblechook brings word of Miss Havisham’s interest in Pip, but in general, Mercer embodies a woman who is a drudge and a harridan at age 30, one who will live with anger and envy more than with joy. Lindsay Smiling impresses with the radiating warmth, sincere friendliness, and essential decency as Joe. Smiling’s portrayal gives you hope Pip and others will find some measure of kindness and guidance in the world. Smiling also shows Joe’s talent as a blacksmith when he fixes a pair of handcuffs with seemingly little effort. Smiling plays a second admirable character as the lawyer’s assistant, Mr. Wemmick, who gives Pip sage advice and who is always cordial when dealing with any matter, financial or personal. 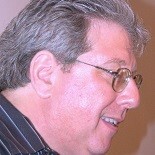 Smiling’s third character is the fop, Bentley Drummle, who he plays to humorous perfection. Brian McCann differentiates well while portraying a slew of characters ranging from the threatening convict, Magwitch, to the practical solicitor, Mr. Jaggers, who never wants to hear any more information than is necessary lest he have to reveal what he knows to others. McCann’s Magwitch has a lot of range. You see his desperation when he first meets Pip and also the look on his face when Magwitch is caught and realizes Pip was not the one who gave away his hiding place. McCann is excellent at playing the later, reformed Magwitch, who, as prisoners often do, tries to go beyond the normal bounds of civility to gain approval and show he is not the scoundrel he was when he committed the crimes that got him sentenced to jail for life. Doug Hara is a bit of a chameleon as he goes from playing some the seamier characters in Pip’s life to playing the earnest and grateful Herbert Pocket, Pip’s study mate and best friend during his days in London. Kate Czajkowski is regal as Estella, who candidly and matter-of-factly relays the lack of feeling that keeps her from responding to Pip and that makes her a poor choice to receive his love. Czajkowski sails through scenes showing Estella’s ennui and her unapologetic way of dismissing and avoiding people, including her benefactress and foster parent, Miss Havisham. Czajkowski gets to lighten up some as Biddy, another who shows some kindness to the young Pip and who sweetens Joe’s life when Pip’s sister passes. Decker’s production moves quickly but smoothly between situations and locations, but it always carefully defines times and place, so there is no confusion. “Great Expectations” runs through Sunday, December 14, at the Arden Theatre, 40 N. 2nd Street, in Philadelphia. Showtimes are 7 p.m. Tuesday and Sunday, 6:30 p.m. Wednesday, 8 p.m. Thursday through Saturday, and 2 p.m. Wednesday, Saturday, and Sunday. No performance is scheduled for Friday, Nov., 7 or Thanksgiving, Thursday, Nov. 27. Tickets range from $50 to $36 and can be obtained by calling 215-922-1122 or by visiting www.ardentheatre.org. This entry was posted on November 5, 2014 by nzoren in Theater Reviews and tagged Arden Theatre, Brian McCann, Charles Dickens, Doug Hara, drama, Gale Childs Daly, Great Expectations, Josh Carpenter, Kate Czajkowski, Lindsay Smiling, Matthew Decker, Philadelphia, Pip, Sally Mercer, Theater, Victorian.